Military Conflicts become Ground Conflicts (as opposed to Naval Conflicts). Shields become Ground Shields (as opposed to Naval Shields). The new Age cards are called Armada cards, but these are still Building cards like those from the base game. The Dockyard boards represent the evolution of the players' fleets. Each fleet consists of one Start space and six upgrade spaces, with most of the upgrade spaces granting a benefit. All Dockyard boards grant the same benefits, but the Naval Construction costs are different from one board to another. Red (military) fleet: Grants access to a new type of war, Naval Conflict. Yellow (commercial) fleet: Grants access to new trade routes. Blue (civilian) fleet: Grants extra Victory Points. Green (scientific) fleet: Grants access to unknown Islands. On each board, one of the 4 fleets bears a Wonder symbol on its Start space. This symbol indicates the color of the fleet linked to the player's Wonder. The Ship figures are in 4 colors (Red, Yellow, Blue, and Green). These make it possible to show the status of the fleets on the players' Dockyard boards. Armada cards are Buildings which have new effects. These are divided by Age, with 2 Red cards, 2 Yellow cards, 2 Blue cards, and 2 Green cards for each Age. Note: Al Armada cards have a logo in their bottom center to be able to sort them easily after use. 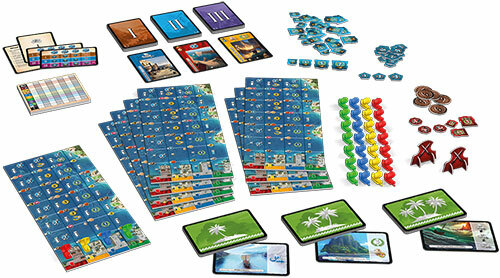 The Island cards represent islands to be explored. These are divided into 3 levels of 9 cards, each offering a unique effect. 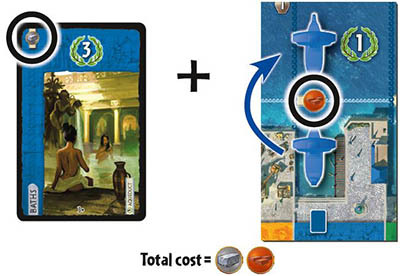 Naval Conflict tokens are different from Ground Conflict tokens from the 7 Wonders base game. Incursion tokens are linked to the Dock, Quay, and Jetty cards. These represent the extra Ground Conflicts linked to these cards. A new score pad is included in this box. It allows players to integrate Victory Points earned from Naval Conflicts, some Island cards, and those present on the Dockyard boards into the game's final scoring. Note: underlined steps refer to the 7 Wonders base game. 1 Sort the cards from the base game by Age according to the number of players. Put the remaining cards back in the box; they won't be used for this game. 2 Sort the Armada cards by Age and shuffle each deck thus formed. For each Age, randomly take as many Armada cards as there are players. Shuffle these cards together with the corresponding Age cards from the base game. Note: For a game with 3 players, return to he box he 5 Armada cards bearing the >> or << icon (Western Emporium, Eastern Emporium, Dock, Quay, and Jetty). Then, proceed as indicated in step 2. 3 Sort the Island cards by level (1, 2, and 3). Shuffle each deck thus formed and place them, face-down, near the middle of the table. 4 Place the Naval Conflict tokens, the Incursion tokens, and the extra Ground Conflict tokens next to the Ground Conflict tokens from the base game. 5 The extra Coins are added to the Coins from the base game and form the bank. Each player begins the game with 3 Coins of value 1, which they place on their board. 6 Place the game aids in the middle of the table so that everyone has access to them during the game. 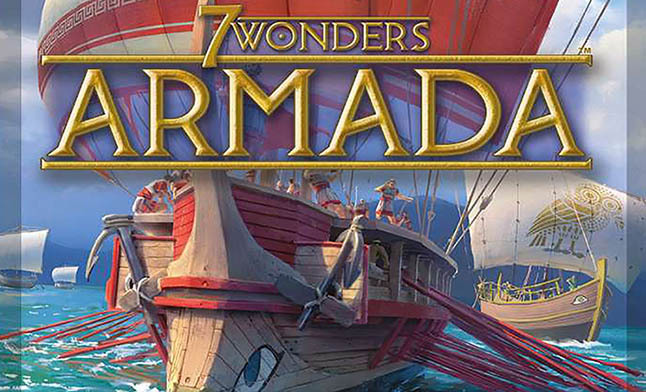 7 Give each player a Dockyard board - which they should place vertically to the right of their Wonder board - and one Ship figure of each color. Place these figures on the Start space of their color. Naval Construction can be performed immediately following the construction of a Building card or during the construction of a Wonder stage. Note: When a Ship reaches the last space of its line of the Dockyard board, it's no longer possible to upgrade the corresponding fleet. When a player constructs a Red, Yellow, Blue, or Green card, they may also perform a Naval Construction and upgrade the fleet of the same color as that of the card constructed. To do so, they must pay, in addition to the cost of the card, the Naval Construction cost of the corresponding color on their Dockyard. If they do so, they move the Ship of the same color one space upward on their Dockyard board. Example: Gabriel constructs a Blue card and so may perform a Blue Naval Construction. His card costs 1 Stone and his Naval Construction costs 1 Clay. He must thus pay a total of 1 Stone and 1 Clay to be able to perform both constructions. It's possible to perform a Naval Construction even when the construction of an Age card is free (such as via chaining, the Olympia Wonder, or with Babel tokens). In this situation, the Naval Construction cost must still be paid according to the usual rules. Important: Cards constructed for free from the DISCARD (Halikarnassos, Solomon..). do NOT allow players to perform a Naval Construction. On each Dockyard board, a Wonder icon appears on the Start space of one of the 4 fleets (Red, Yellow, Blue, or Green). When a player constructs a stage of their Wonder, they may pay, in addition to the cost of that stage, the cost of the Naval Construction of the color associated with the Wonder icon on their Dockyard board. In that situation, they move the Ship of that color one space upward. Example: Ann wants to construct the first stage of her Wonder, Giza, which costs 2 Stones. As the Wonder symbol on her Dockyard board is located on her Red fleet, she also performs a Naval Construction which costs 1 Wood. She must thus pay a total of 2 Stones and 1 Wood to be able to perform both constructions. At the end of each Age, after having resolved the Ground Conflicts of the base game, the players must now resolve a Naval Conflict. Each player calculates their Naval Strength by adding up all of the Naval Shields they have in their City, their Dockyard board, and their Islands, then they compare that total with those of all of the other players. Resolution ALWAYS starts by giving a Naval Defeat token to the player with the weak- est Naval Strength, before giving Naval Victory tokens to the players with the strongest Naval Strength (see chart). The player with the weakest Naval Strength gains 1 Naval Defeat token of value -1, -2, or -3 depending on the current Age. The player with the strongest Naval Strength gains 1 Naval Victory token of value 3, 5, or 7 depending on the current Age. The player with the second-strongest Naval Strength gains 1 Naval Victory token of value 1, 3, or 5 depending on the current Age. The player with the third-strongest Naval Strength gains 1 Naval Victory token of value 3 only in Age III. Clarification: In a given Age, a player who has gained a Naval Defeat token cannot also gain a Naval Victory token. Note: It's possible that some players wil receive no tokens during the resolution of Naval Conflicts. In case of a tie for the weakest Naval Strength, all tied players take a Naval Defeat token of the value corresponding to the current Age. In case of a tie for the strongest Naval Strength, all tied players take the reward for the next lower rank corresponding to the current Age. In this situation, the player with the second-strongest Naval Strength gains no token in Age I and Age II, but gains a Naval Victory token of value 3 in Age III. In case of a tie for the second-strongest Naval Strength, tied players gain no tokens in Age I and Age II. In Age III, they gain one Naval Victory token of value 3 if only ONE player has the strongest Naval Strength, otherwise they gain nothing. 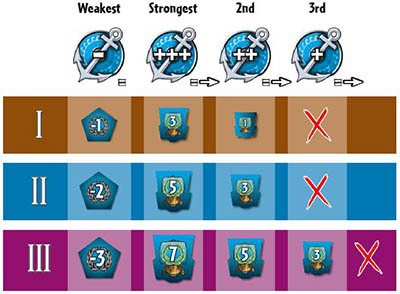 In case of a tie for third-strongest Naval Strength, tied players gain no tokens in Age III. Example: In Age II, Gabriel and Paula have the weakest Naval Strength with 2 Naval Shields, so they each gain a Naval Defeat token of value -2. Ann has the strongest Naval Strength with 8 Naval Shields, so she gains a Naval Victory token of value 5. Romeo and Fred are tied for the second-strongest Naval Strength with 6 Naval Shields each. Since they're tied, they should gain the reward for a rank lower, but there aren't any in Age I. These two players thus gain no tokens. Move their Yellow Ship one space for free (without paying the cost of the Naval Construction). At the end of the game, each Guild card is limited to a maximum value of 10 Victory Points. Example: Romeo played the Philosophers' Guild and the Traders' Guild. The player to his left has 7 Green cards and 4 Yellow cards, and the player to his right has 5 Green cards and 2 Yellow cards. Romeo gets 10 Victory Points for the Philosophers' Guild (and not 12 as he would otherwise), and 6 Victory Points for the Traders' Guild at the end of the game, which gives him a total of 16 Victory Points for his two Guilds. The Red fleet grants Naval Shields and thus increases the Naval Strength of players. A player's Naval Strength corresponds to the number given on the Naval Shields of their Red fleet, which are added to the other Naval Shields present in their City, their Dockyard board, or their Island cards. Example: Gabriel's Red fleet is located on the third upgrade space of his Dockyard board, granting him 3 Naval Shields. In addition, he has an Island card which gives him 2 Naval Shields. His Naval Strength thus is 5. The Yellow fleet indicates the Commercial Level of the players, grants them Coins, and allows them to levy Taxes which impact other players. The last space of this line also grants 2 Naval Shields. When their Yellow fleet reaches a space with a Coin, the player immediately gains the number of coins indicated. A player's Commercial Level corresponds to the number indicated on the Commercial Level symbol of the space in which their Yellow Ship is located. At the end of a turn in which their Yellow fleet reaches a space with the Tax symbol, the player levies a Tax of the indicated amount. When this happens, all of the other players lose the number of Coins indicated MINUS their Commercial Level, which they return to the bank. Example: Paula's Yellow fleet reaches the second upgrade space of her Dockyard board. She immediately gains 2 Coins and levies a Tax of 1 at the end of the turn. Art's Yellow fleet is located on the first upgrade space; he loses no Coins (Tax of 1 - Commercial Level of) Romeo's Yellow fleet is still on the Start space of his Dockyard board; he thus loses 1 Coin as his Commercial Level is a 0 (Tax of 1 - Commercial Level of 0). Clarification: If multiple Taxes are levied at the end of a given turn, only the highest Tax is applied. A player whose Commercial Level is higher than the Tax levied does not gain Coins from Taxation. The Blue fleet grants players Victory Points which will be tallied at the end of the game. The number of Victory Points a player gains corresponds to the space in which their Blue Ship is located at the end of the game. The last space of this line also grants 1 Naval Shield. Example: Romeo's Blue fleet reaches the final space of his Dockyard board. He now has a total of 10 Victory Points in his Dockyard board and his Naval Strength increases by 1. The Green fleet allows players to Explore unknown Islands. When a player's Green Ship reaches an Exploration space, they can Explore a new Island of the corresponding level and thus benefit from its effect. If one player is the only player to Explore an island of that level that turn, they draw 4 Island cards from the corresponding deck and choose the one they want to keep. The player places it to the right of their Dockyard board, so that only the effect appears. They replace all of the unselected cards in the corresponding deck and then shuffle it thoroughly. Example: Art's Green fleet reaches the second upgrade space of his Dockyard board. He is the only one to Explore a level 1 Island that turn. He thus takes 4 level 1 Island cards and chooses the one that he wishes to keep. If multiple players are going to Explore an Island of the same level in the same turn, they deal all of the Island cards of that level between themselves, face down, so that each player receives the same number of cards. Any remaining cards are returned to the middle of the table. Each player chooses, from among the Island cards they are dealt, the one they wish to keep and places it to the right of their Dockyard board, so that only the Island's effect appears. All unselected cards are returned to the corresponding deck and that deck is then shuffled. These cards grant Ground Shields (1/2/ 3 respectively) and create an extra Ground Conflict between the player who constructs one of these cards and the indicated player. Targets the player located to the right of their neighbor to the right. Targets the player located to the left of their neighbor to the left. At the end of the current Age, the player who triggered the Incursion resolves, following the usual rules, a Ground Conflict with their two neighboring players and with the player who has possession of the Incursion token. Once the Ground Conflicts are resolved, the targeted player returns the token to the reserve. Note: Play these cards carefully, as they do not guarantee victory against the targeted player. These cards grant Naval Shields which increase a player's Naval Strength (1/2/3 Naval Shields respectively). 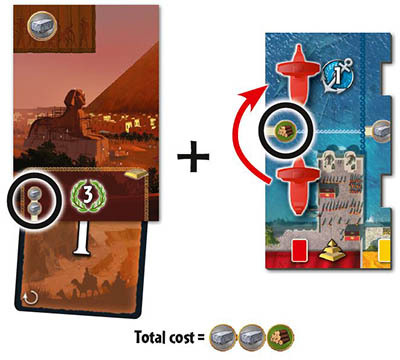 These cards allow the player to freely move one of their Ships, of their choice, upward one space (without having to pay the cost in resources or in Coins). Some of these cards also grant Victory Points (0/0/2/3/4/5 respectively). Clarification: A player is also allowed to perform a Blue Naval Construction when constructing one of these cards and then benefit from the free movement from these cards. A player can therefore perform 2 Naval Constructions during the same turn with these cards. These cards immediately grant Coins or Victory Points (3 / 6 Coins or 4 Victory Points respectively). Moreover, all other players lose 1 Coin per Commercial Level reached by their Yellow fleet. Example: Gabriel's Yellow fleet is on the third upgrade space of his Dockyard; he thus loses 2 Coins. Paula's Yellow fleet is still on her Start space; she therefore loses no Coins. Once per turn, the player can purchase 1 resource of their choice from among those produced by the player located to the right of their right-hand neighbor for 1 Coin. Twice per turn, the player can purchase 1 resource of their choice from among those produced by the player located to the left of their left-hand neighbor for 1 Coin. At the end of the game, the player gains 2 Victory Points for each Commercial Level reached by their Yellow fleet. These cards allow the player to draw the top Island card from the deck of the indicated level (level 1/2/ 3 respectively) and put it in play (to the right of their Dockyard board). The player then benefits from its effect. Note: Be careful not to confuse this effect with Exploration made through Naval Construction. These cards grant a scientific symbol matching the one the player has the most of. In case of a t'e between multiple scientific symbols, the player chooses one from among the tied symbols. Pay all construction costs (card, Wonder, and possibly Naval Construction). Move the Ship corresponding to your Naval Construction, if any. Apply all effects, with the exception of Coin losses. Resolve the construction of cards from the discard (no Naval Construction). Resolve Coin losses (Taxes and Pirates). 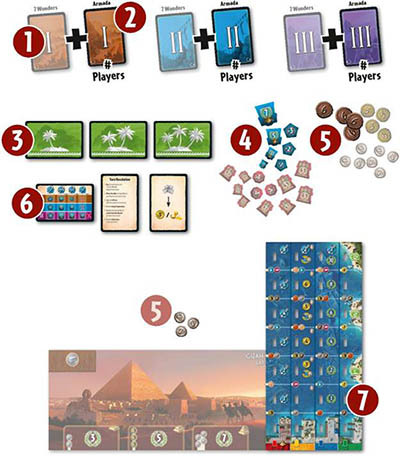 During your games with 4, 6, or 8 players, you can play 7 Wonders with the 2-player team variant. Teammates must sit side by side. When a player causes a loss of money (Taxes or Pirates), their teammate must still pay that loss. Naval Conflicts are resolved individually, according to the usual rules. Ties are resolved normally, even if the tied players are part of the same team. Taxes triggered by the Dockyard board as well as Coin losses triggered by the Pirate Cache, Pirate Lair, Pirate Brotherhood cards and the Pirate Harbor Island card are applied to all players, without taking teams into account. In team games, cards with a >> or << effect work according to the usual rules and respectively target the City to the right of the neighbor to the right or to the left of the neighbor to the left, without taking teams into account. Example: Paula and Gabriel form a team. Paula is sitting between Gabriel (to her right) and Romeo (to her left). In Age II, Gabriel plays the Quay card. This causes a new Ground Conflict and gives an Incursion token to the player to the left of his left neighbor, meaning Romeo. The Dock, Quay, and Jetty cards trigger an extra Ground Conflict, but only give 1 Defeat token or 1 Victory token to the players involved. Each player tallies their Victory Points, and then the two teammates add their scores together to get the total score for their team. The team with the most points wins the game.